This calculator could be used to answer specific questions presented by teachers in a lecture (or homework assignment). For example, educators can pair students up, pick different counties, and encourage students to justify their findings in a scientific report. Understanding the three major greenhouse gases from agriculture and quantifying them is necessary to determine the importance of farm mitigation options. By altering or adopting different practices, farmers have the potential to reduce their greenhouse gas footprint and make a contribution to mitigating climate change both regionally and at the global scale. This interactive webpage allows for calculation of greenhouse gas emissions from different crops types in counties all over the United States. The user can change conditions in croplands to see how they change greenhouse gas emissions. It is a good tool for comparison of how crop types, management activities, and climatic variables affect greenhouse gas emissions from agricultural lands. Comments from expert scientist: The ability to calculate county-level agricultural greenhouse gas emissions changes on the fly and comprehensive scenario control over farm management practices IPCC (Intergovernmental Panel of Climate Change) and other well-known data sources are good strengths of the resource. The website has a large map of US counties that allows users to compare effects of different baseline scenarios and management practices on greenhouse gas emissions. Students can use this website to explore a variety of questions about factors controlling greenhouse gas emissions from croplands. Students can alter environmental conditions and compare different scenarios and the costs to the environment. Basic instructions are provided as a guide. 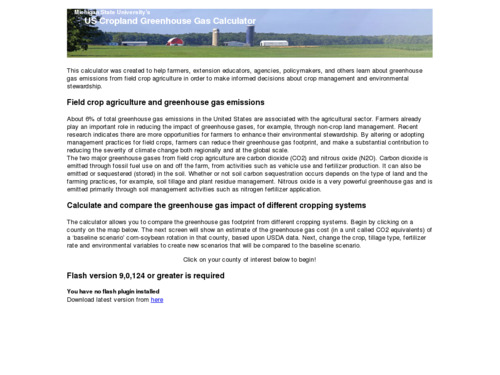 The website is easy to use and there is a link to instructions for changing variables in the greenhouse gas calculator at the top of the calculator page. It is a very simple graphic calculator, but it provides the premise for some powerful discussions among students.